The development of the surface settlement trough above a tunnel is well described by a Gaussian distribution curve for the case of a single tunnel in “greenfield” conditions. Based on this method, the volume of the surface settlement trough is simply assumed as equal to the amount of the ground loss in the region close to the tunnel. 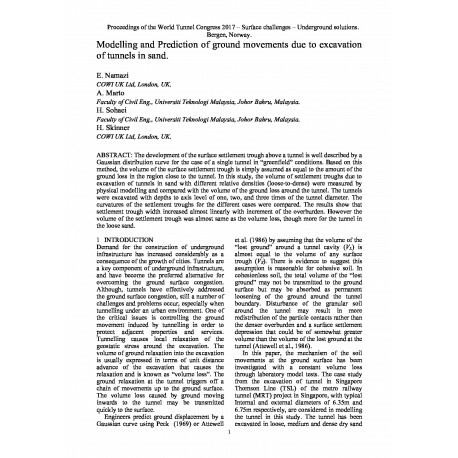 In this study, the volume of settlement troughs due to excavation of tunnels in sand with different relative densities (loose-to-dense) were measured by physical modelling and compared with the volume of the ground loss around the tunnel. The tunnels were excavated with depths to axis level of one, two, and three times of the tunnel diameter. The curvatures of the settlement troughs for the different cases were compared. The results show that settlement trough width increased almost linearly with increment of the overburden. However the volume of the settlement trough was almost same as the volume loss, though more for the tunnel in the loose sand. 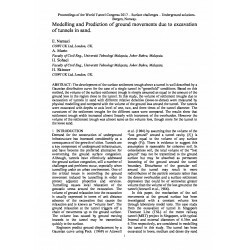 Abstract: The development of the surface settlement trough above a tunnel is well described by a Gaussian distribution curve for the case of a single tunnel in “greenfield” conditions. Based on this method, the volume of the surface settlement trough is simply assumed as equal to the amount of the ground loss in the region close to the tunnel. 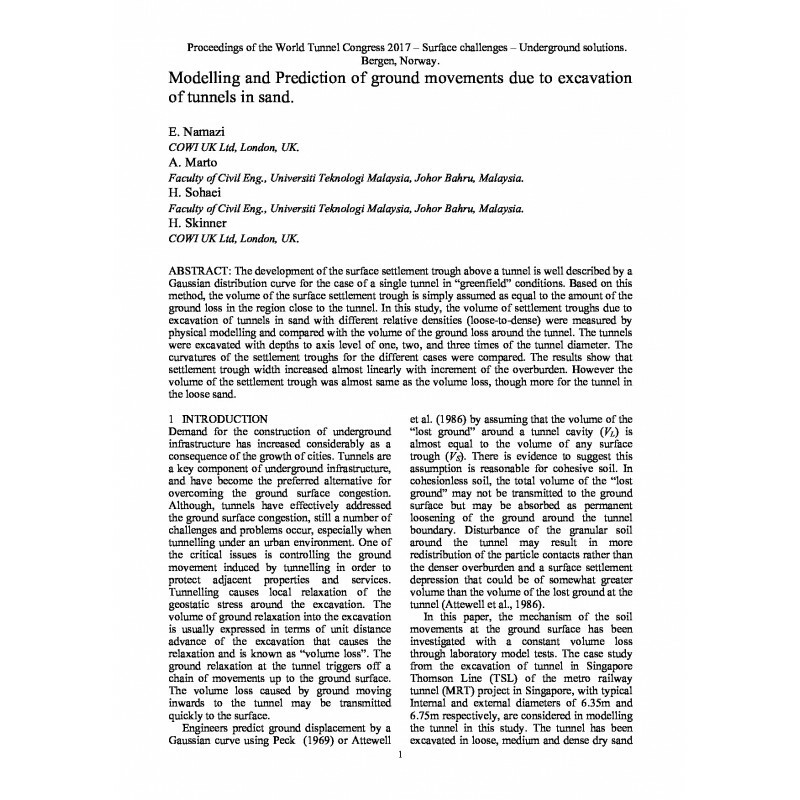 In this study, the volume of settlement troughs due to excavation of tunnels in sand with different relative densities (loose-to-dense) were measured by physical modelling and compared with the volume of the ground loss around the tunnel. The tunnels were excavated with depths to axis level of one, two, and three times of the tunnel diameter. The curvatures of the settlement troughs for the different cases were compared. The results show that settlement trough width increased almost linearly with increment of the overburden. However the volume of the settlement trough was almost same as the volume loss, though more for the tunnel in the loose sand.